The ovirt-engine-extension-aaa-ldap extension allows users to customize their external directory setup easily. The ovirt-engine-extension-aaa-ldap extension supports many different LDAP server types, and an interactive setup script is provided to assist you with the setup for most LDAP types. If the LDAP server type is not listed in the interactive setup script, or you want to do more customization, you can manually edit the configuration files. See Section 14.3.3, “Configuring an External LDAP Provider (Manual Method)” for more information. For an Active Directory example, see Section 14.3.2, “Attaching an Active Directory”. The domain management tool, engine-manage-domains, used in previous versions of Red Hat Enterprise Virtualization is not supported after 3.6. You need to know the domain name of the DNS or the LDAP server. Round-robin and failover policies are also supported. To set up secure connection between the LDAP server and the Manager, ensure a PEM-encoded CA certificate has been prepared. See Section D.2, “Setting Up SSL or TLS Connections between the Manager and an LDAP Server” for more information. Unless anonymous search is supported, a user with permissions to browse all users and groups must be available on the directory server to be used as the search user. Note down the search user's distinguished name (DN). Do not use the administrative user for the directory server. Have at least one set of account name and password ready to perform search and login queries to the LDAP server. Specify a profile name. The profile name is visible to users on the login page. This example uses redhat.com. To rename the profile after the domain has been configured, edit the ovirt.engine.aaa.authn.profile.name attribute in the /etc/ovirt-engine/extensions.d/redhat.com-authn.properties file. Restart the engine service for the changes to take effect. Users need to select the desired profile from the drop-down list when logging in for the first time. The information is then stored in browser cookies and preselected the next time the user logs in. Select an LDAP type by entering the corresponding number. If you are not sure which schema your LDAP server is, select the standard schema of your LDAP server type. For Active Directory, follow the procedure at Section 14.3.2, “Attaching an Active Directory”. It is highly recommended to use DNS resolution for LDAP server. If for some reason you intend to use hosts or plain address disable DNS usage. For option 1, the DNS servers listed in /etc/resolv.conf is used to resolve the IP address. Ensure the /etc/resolv.conf file is updated with the correct DNS servers. Enter the fully qualified domain name (FQDN) or the IP address of the LDAP server. You can use the dig command with the SRV record to find out the domain name. An SRV record takes the following format: _service._protocol.domain name. For example: dig _ldap._tcp.redhat.com SRV. For option 2, enter the domain name of the DNS server. A DNS search is performed to look up the SRV records to find out the domain name of the LDAP server. For option 3, enter a space-separated list of LDAP servers. Use either the FQDN or IP address of the servers. This policy provides load-balancing between the LDAP servers. Queries are distributed among all LDAP servers according to the round-robin algorithm. For option 4, enter a space-separated list of LDAP servers. Use either the FQDN or IP address of the servers. This policy defines the first LDAP server to be the default LDAP server to respond to queries. If the first server is not available, the query will go to the next LDAP server on the list. Select the secure connection method your LDAP server supports and specify the method to obtain a PEM-encoded CA certificate. The file option allows you to provide the full path to the certificate. The URL option allows you to specify a URL to the certificate. Use the inline option to paste the content of the certificate in the terminal. The system option allows you to specify the default location for all CA files. If the insecure mode is selected, the connection is still encrypted using TLS but certificate validation is skipped. It is highly recommended to use secure protocol to access the LDAP server. Protocol startTLS is the standard recommended method to do so. Only in cases in which the startTLS is not supported, fallback to non standard ldaps protocol. Use plain for test environments only. LDAPS stands for Lightweight Directory Access Protocol Over Secure Socket Links. For SSL connections, select the ldaps option. For more information on creating a PEM-encoded CA certificate, see Section D.2, “Setting Up SSL or TLS Connections between the Manager and an LDAP Server”. Enter the search user distinguished name (DN). The user must have permissions to browse all users and groups on the directory server. The search user must be specified in LDAP annotation. If anonymous search is allowed, press Enter without any input. Test the search and login function to ensure the your LDAP server is connected to your Red Hat Enterprise Virtualization environment properly. For the login query, enter the account name and password. For the search query, select Principal for user accounts, and select Group for group accounts. Enter Yes to Resolve Groups if you want the group account information for the user account to be returned. Select Done to complete the setup. Three configuration files are created and displayed in the screen output. Perform at least one Login sequence and one Search sequence. Restart the engine service. The profile you have created is now available on the Administration Portal and the User Portal login pages. To assign the user accounts on the LDAP server appropriate roles and permissions, for example to log in to the User Portal, see Section 14.7, “Administering User Tasks From the Administration Portal”. For more information, see the LDAP authentication and authorization extension README file at /usr/share/doc/ovirt-engine-extension-aaa-ldap-version. You need to know the Active Directory forest name. The forest name is also known as the root domain name. You need to either add the DNS server that can resolve the Active Directory forest name to the /etc/resolv.conf file on the Manager, or note down the Active Directory DNS servers and enter them when prompted by the interactive setup script. Unless anonymous search is supported, a user with permissions to browse all users and groups must be available on the Active Directory to be used as the search user. Note down the search user's distinguished name (DN). Do not use the administrative user for the Active Directory. Have at least one set of account name and password ready to perform search and login queries to the Active Directory. Select an LDAP type by entering the corresponding number. The LDAP related questions after this step is different for different LDAP types. Enter the Active Directory forest name. If the forest name is not resolvable by your Manager's DNS, the script prompts you to enter a space-separated list of Active Directory DNS server names. Select the secure connection method your LDAP server supports and specify the method to obtain a PEM-encoded CA certificate. The file option allows you to provide the full path to the certificate. The URL option allows you to specify a URL to the certificate. Use the inline option to paste the content of the certificate in the terminal. The system option allows you to specify the location for all CA files. The insecure option allows you to use startTLS in insecure mode. Enter the search user distinguished name (DN). The user must have permissions to browse all users and groups on the directory server. The search user must be of LDAP annotation. If anonymous search is allowed, press Enter without any input. 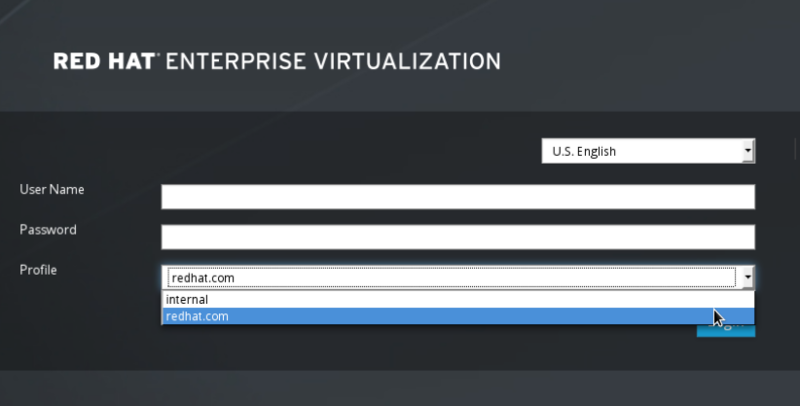 Test the search and login function to ensure your LDAP server is connected to your Red Hat Enterprise Virtualization environment properly. For the login query, enter the account name and password. For the search query, select Principal for user accounts, and select Group for group accounts. Enter Yes to Resolve Groups if you want the group account information for the user account to be returned. Select Done to complete the setup. Three configuration files are created and displayed in the screen output. The profile you have created is now available on the Administration Portal and the User Portal login pages. To assign the user accounts on the LDAP server appropriate roles and permissions, for example to log in to the User Portal, see Section 14.7, “Administering User Tasks From the Administration Portal”. The ovirt-engine-extension-aaa-ldap extension uses the LDAP protocol to access directory servers and is fully customizable. Kerberos authentication is not required unless you want to enable the single sign-on to the User Portal or the Administration Portal feature. If the interactive setup method in the previous section does not cover your use case, you can manually modify the configuration files to attach your LDAP server. The following procedure uses generic details. Specific values depend on your setup. Copy the LDAP configuration template file into the /etc/ovirt-engine directory. Template files are available for active directories (ad) and other directory types (simple). This example uses the simple configuration template. # Search user and its password. To use TLS or SSL protocol to interact with the LDAP server, obtain the root CA certificate for the LDAP server and use it to create a public keystore file. Uncomment the following lines and specify the full path to the public keystore file and the password to access the file. For more information on creating a public keystore file, see Section D.2, “Setting Up SSL or TLS Connections between the Manager and an LDAP Server”. Review the authentication configuration file. The profile name visible to users on the Administration Portal and the User Portal login pages is defined by ovirt.engine.aaa.authn.profile.name. The configuration profile location must match the LDAP configuration file location. All fields can be left as default. Review the authorization configuration file. The configuration profile location must match the LDAP configuration file location. All fields can be left as default. The example profile you have created is now available on the Administration Portal and the User Portal login pages. To give the user accounts on the LDAP server appropriate permissions, for example to log in to the User Portal, see the Red Hat Enterprise Virtualization Manager User Tasks section of the Red Hat Enterprise Virtualization Administration Guide.